Breakfast for Dinner | What's for Dinner? Who says breakfast is only for the morning time?! Enjoy some of your favorite breakfast food for dinner with this delectable menu. Asparagus, poached egg, and bacon with a drizzle of Simply 60® Balsamic Vinaigrette and a side of Sister Schubert’s® Artisan Style Mini Baguettes make this mixed salad a brunch classic. 30% of homecooks would also make this recipe! 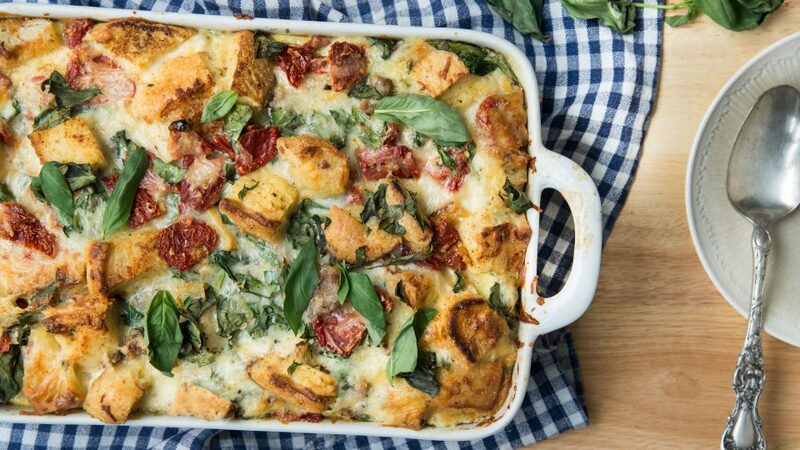 Bake up this bubbly, cheesy casserole full of sausage, spinach and Mediterranean flavors like basil and sun-dried tomatoes. 57% of homecooks would also make this recipe! Leftover yeast rolls spread with butter, sugar and cinnamon make an easy breakfast treat.